UFPI (Universal Flash Programming Interface) this is USB-powered device based on modern secured dual-core 200Mhz CPU with High-Speed USB Phy (480 mbps). 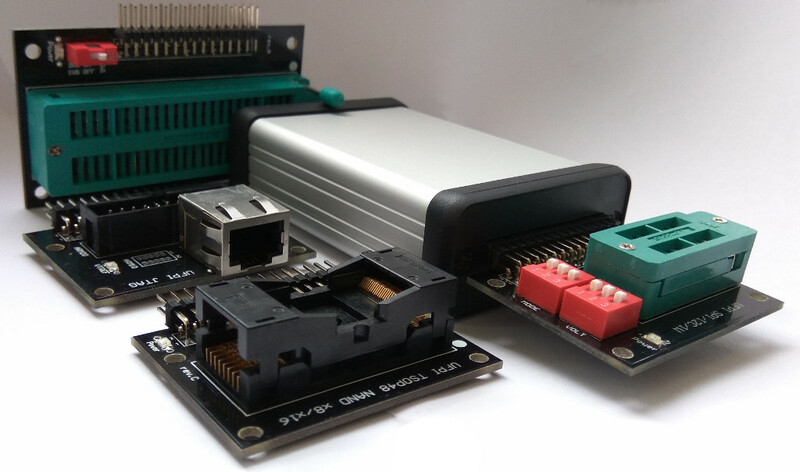 The main purpose of this interface and software is the Flash or EEPROM memory programming and work with main serial protocols such as JTAG, SPI, I2C, NAND, eMMC, SD, 1W and so on. The main goals are the maximum speed, simplicity of the interface and the maximum number of possibilities for the user. Scripts with C-like syntax and direct access to the software, OS and UFPI box hardware functions allows user to create (if necessary) their own fully functional script applets without using the IDE, compilers and other programming hardware. The ability to use external configuration files for the IC’s allows to use any necessary parameters, commands and frequency as well as create any necessary configuration even for «unsupported» chips. Very fast speed. For example working with NAND faster than the «fastest» ChipProg-481. No need drivers for Windows. Plug-and-Play for Win10 and Win8 (WCID Device). USB-powered with legal USB VID and PID. Plug-and-Play sockets. Software automatically selects the appropriate mode and voltage on connect. Safe and secure Box updates. Mirrored updater with AES256. Support user chip parameters — geometry, voltage, access time etc. Flexible licensing system. Your can use those modules that you needs. Multi-part data Packages with user defined compression and encryption. Builtin Package Editor and Builder. Fixed modes for connected sockets.